The new 46,000 square foot, two-level expansion contains a full-size gym, non-varsity recreational sports fitness facilities, and varsity sports conditioning facilities, including a 37-foot climbing wall and two weight rooms. The addition links to existing gyms, a swimming pool, an ice sheet, the field house and other sports functions in nearby facilities. 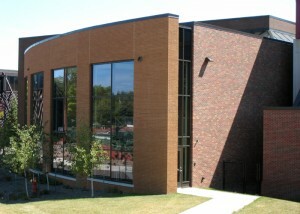 In an adjacent building, the locker rooms were remodeled as part of this project. Floor construction is primarily a blend of precast plank supported by precast beams and columns and masonry bearing walls, with remaining floors using a composite steel and slab-on-metal deck framing system. Lateral loads are resisted primarily by masonry bearing walls. Low roof framing is steel beams and metal deck with long-span (100’) joists and acoustic deck over the gymnasium. Foundations consist of conventional spread footings and cast-in-place and masonry bearing walls.